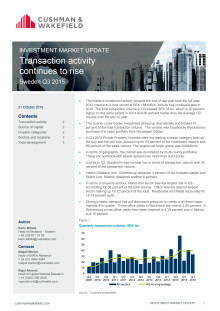 Transaction activity continues to rise. The massive investment activity towards the end of last year took the full year 2014 volume to a new record at SEK 158 bn. Activity has continued also in 2015. The total transaction volume in Q3 totalled SEK 33 bn, which is 30 % higher on the same period in 2014 and 60 % higher than the average Q3 volume over the last 10 year. Download the report here.